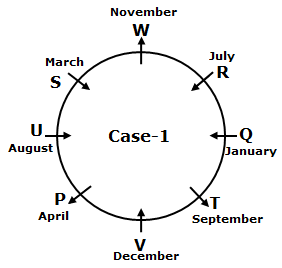 Eight persons P, Q, R, S, T, U, V and W are sitting in a circular table and born in different months viz., January, March, April, July, August, September, November and December of the same year but not necessary in the same order. The persons who are born in the months which has 31 days facing centre of the table. The persons who are born in the months which has less than 31 days facing away from the centre. R sits third to the right of the one who was born in December. Only one person sits between R and the one who was born in March. T sits opposite to the one who was born in March and is born in September. W sits third to the left of T. The one who was born in August sits third to the right of R. S sits second to the right of P, who is an immediate neighbour of the one who was born in December. Q was born in January. P is elder than W. V is younger than U. 1. U was born in which of the following months? R sits third to the right of the one who was born in December. Only one person sits between R and the one who was born in March. T sits opposite to the one who was born in March and is born in September. W sits third to the left of T. The one who was born in August sits third to the right of R.
S sits second to the right of P, who is an immediate neighbour of the one who was born in December. Q was born in January. P is elder than W. V is younger than U. 2. How many person are sitting between R and the one who was born in April? 4. If S is related to April and V is related to January in a certain way. 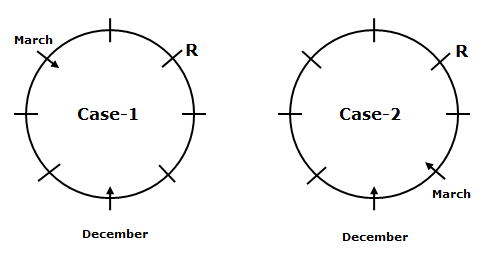 Then R is related to which of the following? Direction (6-8): In each questions below is given a statement followed by two assumptions numbered I and II. An assumption is something supposed or taken for granted. You have to consider the statement and the following assumptions and decide which of the assumptions is implicit in the statement. Give answer (a) if only Assumption I is implicit. (b) if only Assumption II is implicit. (c) if either Assumption I or II is implicit. (d) if neither Assumption I nor II is implicit. (e) if both Assumption I and II are implicit. The number of people entering through the main gate is increasing time to time. The chief guest of the function is going to enter through the main gate. Because of either the problem of crowd or may be the chief guest entering through the main gate, the college management was locked the main gate. The people don’t have the sense even about conservation of the water. Due to the water crisis in the summer season the authorities advised the people. Assumption II only implicit the given statement. The ministry wishes to make more revenue during the festival season. The public opted no other way for travelling to their natives for celebrating the festival. Neither of the assumptions is implicit for the given statement. Directions (9-10): In each question below given statements followed by two courses of action numbered I and II. On the basis of the information given in the statement, you have to assume everything in the statement to be true, then decide which of the suggested courses of action logically follow(s) for pursuing. Give answer: (a) if only I follows. (b) if only II follows. (c) if either I or II follows. (d) if neither I nor II follows. (e) if both I and II follow. The Environment Ministry took an immediate action to ban the non eco-friendly materials. The government advised the people to move to the pollution free areas as soon as possible. The government must take the necessary steps to decrease the pollution level. So, action I must be followed. The government should give the voluntary retirement to the elders in the service. The government should increase the number of skill development centres for the unemployed youths. The action II will follows the given statement. 1) U was born in which of the following months? 2) How many person are sitting between R and the one who was born in April? 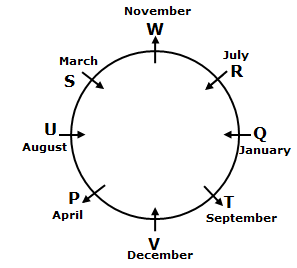 4) If S is related to April and V is related to January in a certain way. Then R is related to which of the following? Direction (6-8): In each questions below is given a statement followed by two assumptions numbered I and II. An assumption is something supposed or taken for granted. You have to consider the statement and the following assumptions and decide which of the assumptions is implicit in the statement. (c) if either Assumption I or II is implicit. (d) if neither Assumption I nor II is implicit. (e) if both Assumption I and II are implicit. 6) Statement: The XYZ college administration blocked the main gate of the campus on the annual day function. I. The number of people entering through the main gate is increasing time to time. II. The chief guest of the function is going to enter through the main gate. 7) Statement: The municipality authorities are advised and instructed the people not to waste the drinking water. I. The people don’t have the sense even about conservation of the water. II. Due to the water crisis in the summer season the authorities advised the people. 8) Statement: The Ministry of Railways increase the number of special trains during the festival season. I. The ministry wishes to make more revenue during the festival season. II. The public opted no other way for travelling to their natives for celebrating the festival. Directions (9-10): In each question below given statements followed by two courses of action numbered I and II. On the basis of the information given in the statement, you have to assume everything in the statement to be true, then decide which of the suggested courses of action logically follow(s) for pursuing. (b) if only II follows. (c) if either I or II follows. (d) if neither I nor II follows. (e) if both I and II follow. 9) Statement: The level of air pollution level in the country is rapidly increasing last two years. I. The Environment Ministry took an immediate action to ban the non eco-friendly materials. II. The government advised the people to move to the pollution free areas as soon as possible. 10) Statement: As per the recent report, the percentage of the employed youths in the country was decreased from the last year. I. The government should give the voluntary retirement to the elders in the service. II. The government should increase the number of skill development centres for the unemployed youths.